Talking with a friend in a public house the topic of Doctor Who was brought up. Not that unusual with that friend. What we were talking about was a fan theory. It simply states that Doctor Who and HitchHikers Guide to the Galaxy are in the same universe. I agree with it. The more you look into it the more the theory works. There are not that many examples out there but the ones that can be spotted are quite clear. Let us start our journey with two heroes. 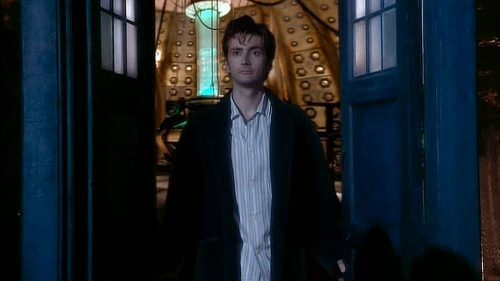 In the Christmas Invasion, the Doctor describes himself, when dressed in a dressing gown, “Very Arthur Dent”, then goes on talking about the gentleman in question. It’s not 100% clear if he’s talking to someone he has met or just heard of. Then again, he does call Arthur a “great guy” shortly afterwards. Are we on a different Earth? Is it the nature of the plural zone planets again? The Vogons did destroy the Earth, didn’t they? We can only assume that The Doctor met Arthur whilst he was on his travels around the universe after The Earth Mark 1 was destroyed. If this is the case then which Earth are we on? Is it a different Earth from other re-generations. It is always in the same place but not always the same one. Plural zone planets tend to do this. This could also explain how people forget that there was the Loch Ness Monster in the Thames or invasion of various aliens from around the galaxy. Cybermen or Daleks in London for example. The fourth Doctor is also seen reading one of Oolon Colluphid’s books. Not the famous “God series” [Where God Went Wrong, Some More of God’s Greatest Mistakes, Who is This God Person Anyway & Well That About Wraps it Up for God]. This one, however, is called “Origins of the Universe”. 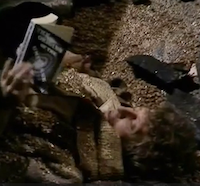 The Doctor can be seen reading the book in Destiny of the Daleks. The Doctor isn’t that fond of the author’s conclusions as he comments that Oolon should have asked someone who “Saw it happen”. Another connection between the two appeared in the 2005 HitchHiker’s film. In the Magrathea showroom you can see the planets under constructions. One of these is called Shada. The name of the prison planet in the infamous serial of the same name. 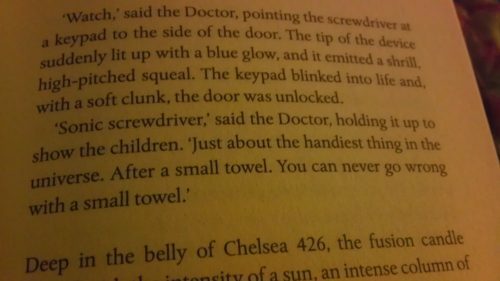 A subtle one is when the Doctor talks about his sonic screwdriver. He mentions that it’s the second most useful thing in the universe. The first is, of course, a towel. Well, a small one at least as it must be easier to carry than a full-sized one! This is from the novel “The Taking of Chelsea 426“. There is a link between the two series anyway. The author of the HitchHiker’s books, Douglas Adams, was also script editor for Doctor Who in the 70s. However, the serial that saw Oolon’s book mentioned isn’t one that Douglas worked on. It does seem that Douglas sneaked that line into the episode. These are tiny snippets from over the years that Doctor Who has been running. On the other hand, with the infinite improbability drive running the Heart of Gold it must be possible that they have met at multiple points over the years.